Having a close look at this picture one can identify a character standing in the middle of with what appears to be a dilapidated capitol building as the backdrop. 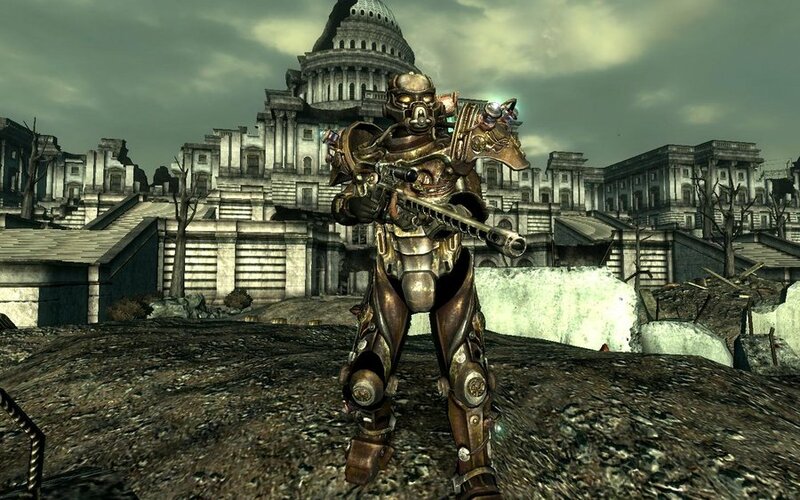 The picture above is from the video game Fallout 3 from the Fallout series. The name really tells what the setting of the game is: a post-nuclear wasteland right in the middle of the former capitol of the once glorious United States. The character in the middle of the image is what is known as the “hero,” (or villain depending on your actions) that you play as in the game. This image was taken from a Deviant Art forum (http://www.deviantart.com/art/Fallout-3-Character-3-102739970) and was posted by a user named Ghettomole. It is a screenshot of the game and it was posted in 2008. The image itself is only about 1440 by 900 pixels and occupies only about 156 kilobytes on my computer’s hard drive. The image is supposed to take place somewhere in the near-future, post nuclear war. The game serves as a homage to the 1950’s and takes and uses the spirit of the time to its fullest advantage. This game uses that time’s music and artistic style taking inspiration from art deco, abstract expressionism, and pop art as well as taking tunes from the Jazz and swing movements. This image brings up the driving question to the game: What would happen if a nuclear war had broken out in the Cold War era? This question, essentially a simple what-if scenario is what made me choose this image. This picture makes the superficial viewer think of what the background is but the deeper viewer will think why the background is as it is; why is D.C. destroyed and obliterated and why is that character there. The strange futuristic armor that the character has only adds to the intrigue as well. Learning in lecture about the fervor and widespread fear rampant in and around the American psyche during the 1950’s Cold War made me think of this video game. Besides being a personal favorite, I also chose this image because I find it fascinating how far American society and culture in general has gotten; we can simply laugh and have fun with a scenario that used to strike fear into people as close as our parents.